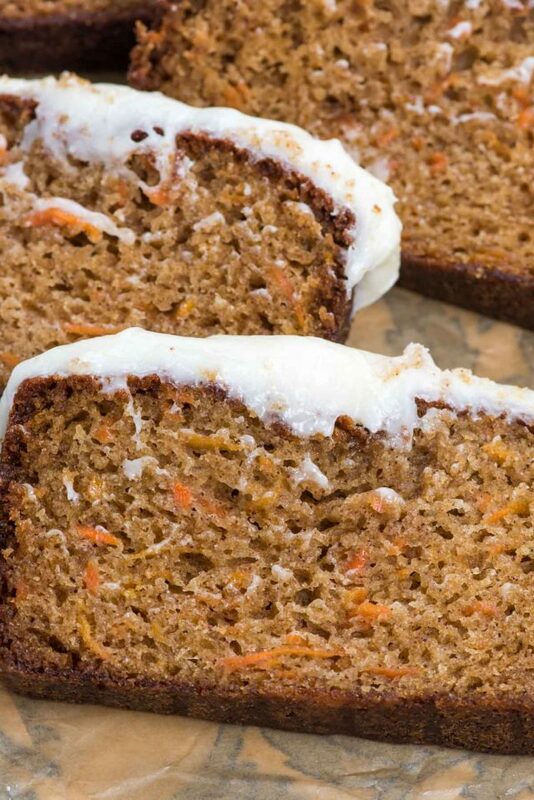 This is the BEST Carrot Cake Loaf Cake you’ll ever make. It’s soft and FULL of carrot cake flavor with a delicious cream cheese frosting! I know Carrot Cake is normally deemed dessert but since it’s in loaf form, I also call this a breakfast recipe. Yes? I’m so exhausted you guys. This week I’m at the Mediavine Publishers Conference and it’s been 3 days of nonstop networking and learning. It’s been amazing, just tiring. The conference is being hosted at one of the Google complexes in Silicon Valley, so we leave the hotel on buses at 8am and then learn all day and go for dinner and go to bed too late. Except today I just couldn’t keep going, so I left after lunch and am sitting in a quiet hotel room trying to stay awake and write this post. My brain is a little fried, so…that’s all for the chit chat. It’s MARCH already (um, what?) which means that Easter is just around the corner. What’s something everyone makes at Easter? Carrot Cake! 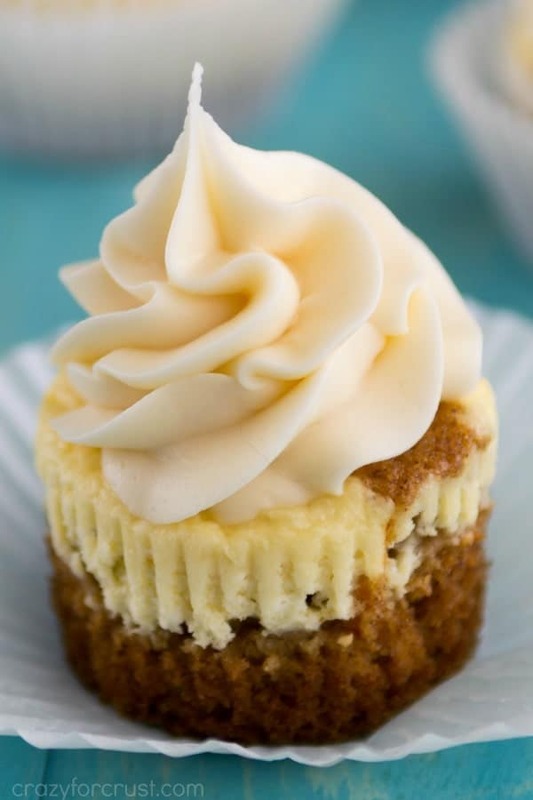 Carrot cake is one of those things I love in all forms: cinnamon rolls, cupcakes, pie, coffee cake…you name it, I love it. 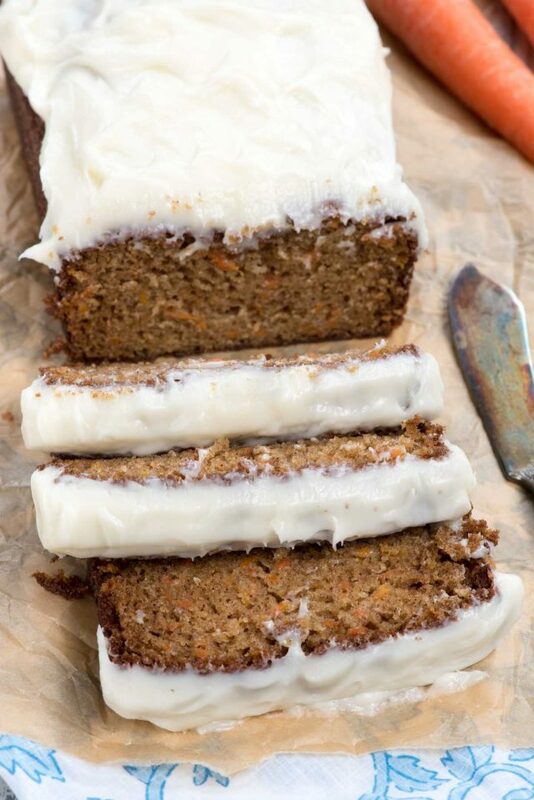 For this easy carrot cake loaf recipe, I turned my favorite carrot cake recipe into two loaves. Sometimes loaf cakes are just better, you know? They’re easier to frost, slice, eat, and store…plus this recipe makes two so there’s one for me and one for you. And also, let’s not forget the frosting. Usually any cake I eat is a vehicle for frosting, but especially when it’s CREAM CHEESE frosting. Cream cheese frosting is the best frosting, especially when paired with the cake full of spices like ginger and cinnamon and carrots. It’s a bit spicy and a bit sweet and all delicious. Move over Easter, I’m making carrot cake a year round thing. Plus, loaf cake is like quick bread and quick bread is for breakfast so now you can eat carrot cake for breakfast. This moist Carrot Cake Loaf is a smaller version of my favorite carrot cake recipe topped with the most delicious cream cheese frosting! This recipe makes TWO loaves. You could easily cut the recipe in half if you only want one, but I love making two. One to eat, one to gift. Be sure to shred your own carrots. The pre-shredded ones are too thick for cake. I love adding applesauce for two reasons: one, it cuts down on the amount of oil you need, and two, it gives a nice moist flavor to the cake. You can add nuts or raisins if you want. I love walnuts in carrot cake! Loaf cakes freeze really easily, frosted or unfrosted. That makes this the perfect cake to make ahead of time. 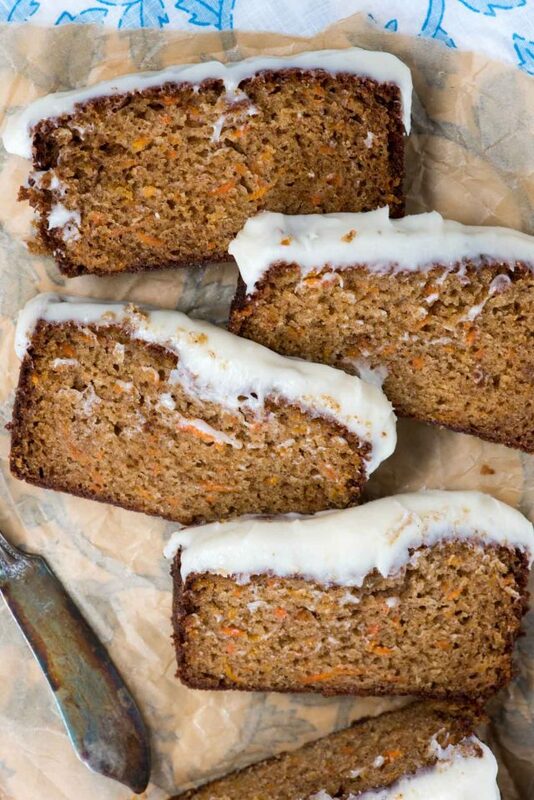 This is the BEST Carrot Cake Loaf Cake you'll ever make. It's soft and FULL of carrot cake flavor with a delicious cream cheese frosting! Preheat oven to 350°F. Grease and flour two 8x4-inch loaf pans. Whisk salt, baking powder, baking soda, cinnamon, ginger, nutmeg, and flour in a medium bowl. Set aside. Whisk eggs until beaten, then whisk in oil, vanilla, applesauce and both sugars. Whisk until combined, then add dry ingredients and stir with a spatula or wooden spoon until just combined. Stir in carrots. Pour batter evenly into the prepared pans. Bake for 40-55 minutes or until a toothpick comes out almost clean in the center. Let the cake completely cool before removing from the pan and frosting. Remove cakes from pans and frost the top, then slice and serve. 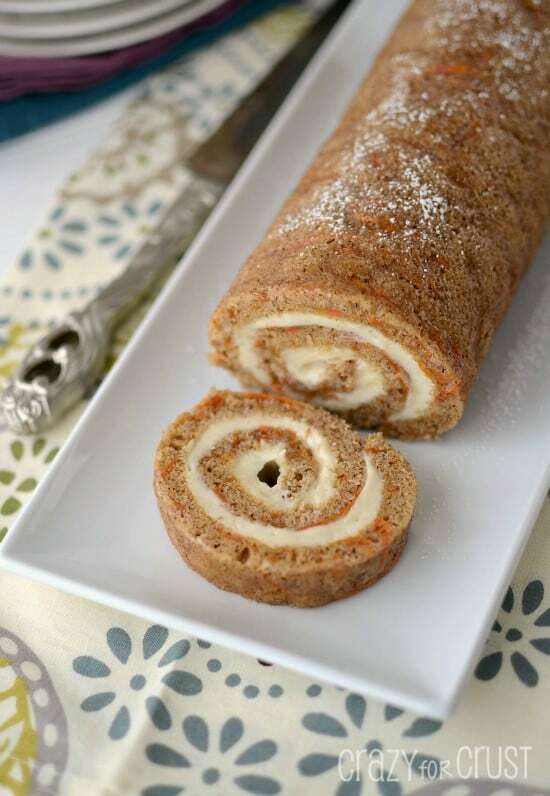 Be sure to check out all my carrot cake recipes as well as other Easter recipes, Aimee’s Carrot Cake Cheesecake Cake, these Carrot Cake Scones, or Jocelyn’s Carrot Cake Pound Cake! The MV event has looked amazing from everyone’s photos I saw (okay the socializing part looks the best) but yes I hear you on the nonstop go-go-go all day long full on mode; I am not cut out for those types of events lol. I hope you can catch up on your sleep this week! 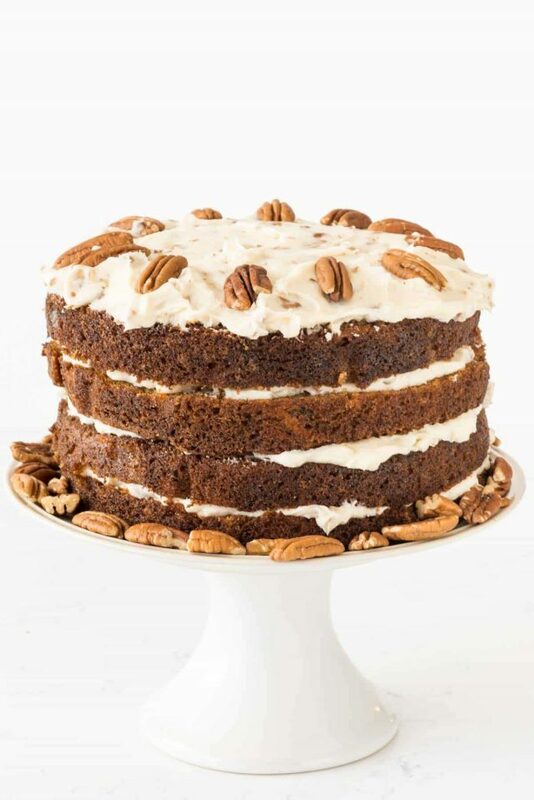 This carrot cake…yes looks soooo good! I adore carrot cake! Wish I had a slice right now! YUM! In making plans for an Easter buffet, I tested this recipe. It’s a winner. Easy to put together, super moist, & delicious, I was short 1/2 cup of oil, so used more apple sauce. Perfect. Great cream cheese icing recipe. Sprinkled the top with chopped nuts. So pretty! I’ll make this again and again. Thanks, Dorthy. Really moist and soft but it still cut very well…. and hallelujah, for once a recipe with accurate oven times! (So often I need to bake fir much longer than advised). I added walnuts to mine also no with dried cranberries as didn’t have sultanas. Next time I think I’ll just stick with the walnuto though. The cake mixture was strong enough to hold them so they didn’t all sink to the bottom on baking. Brill Ant recipe – thanks v much ? Made this for Easter and it was a huge hit. Great flavor and moist. I am keeping in my favorite recipe file! Are you sure it only needs 2 cups of flour? Oh my! This is an amazing recipe. I won’t be using another. Making my third loaf within a week. Delicious with chunks of walnuts. Even after I froze a loaf, it was so moist. I did not put any icing on it; it was great as is. This recipe is AMAZING! We loved it, people at work loved it, and everyone else we shared it with. I made the applesauce as well (super easy). People literally RAVED about how good it is. I made the actual recipe the first time with extra spices (2 heaping tsp. of cinnamon, 1/2 tsp. of nutmeg and ginger). This time I added raisins and walnuts (1 c. of each). I’m sure the batter can accommodate the “extras”. And that frosting is AMAZING! Update on my previous post – the nuts and raisins in this cake are wonderful! Thanks again for my go-to carrot cake, and may I say again – the frosting is amazing as well! Could this be made in a Bundt pan?